In the helping professions, codes of ethics and decision-making models have been the primary vehicles for determining what constitutes ethical practice. These strategies are insufficient since they assume that shared meanings exist and that the contradictory universal principles of codes can be reconciled. Also, these tools do not emphasize the significance of context for ethical practice. 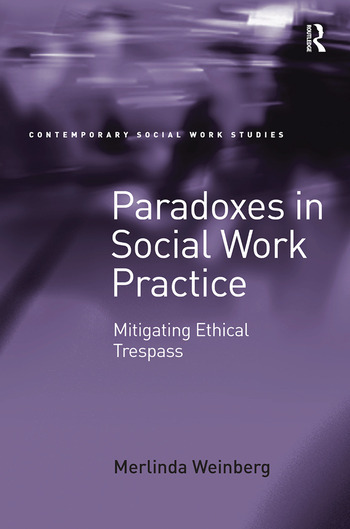 This book takes a new critical theoretical approach, which involves exploring how social workers construct what is ’ethical’ in their work, especially when they are positioned at the intersection of multiple paradoxes, including that of two opposing responsibilities in society: namely, to care for others but also to prevent others from harm. The book is built on narratives from actual front-line workers and therefore is more applicable and grounded for practitioners and students, offering many suggestions for sound practice. It illustrates that an understanding of ethics differs from worker to worker and is heavily influenced by context, workers’ values, and what they take up as the primary discourses that frame their perceptions of the profession. While recognizing the oppressive potential of social work, the book is rooted in a perspective that ethical practice can contribute to a more socially just society. Merlinda Weinberg is Associate Professor in the School of Social Work at Dalhousie University in Canada. Prior to this she worked for 25 years as a front-line social worker, manager, consultant and practitioner in private practice.